Bailey Jacobs is a down-and-out 17-year-old goth, having lost her job and breaking up with her boyfriend. However, she isn't the only one with problems in town; there have been many dogs disappearing without a trace. Bailey happens upon a clue, but when she reports it to the police they do not believe her as she already has a bad reputation due to the actions of her ex-boyfriend. She decides that she is the only hope for the dogs and plays amateur detective to find out who is responsible for the missing canines. She is certain she knows who is behind it, but the only way for her to convince the authorities to act may be by committing an offense herself! This first novella nicely sets the scene both for this book, as well as Bailey's future antics. There are several possible paths the future books could take based upon the hints given in this first story. The target audience for this book is young adults, but I enjoyed it as well and look forward to the next installment of this series. VJ Barrington is sure to have a wide and devoted following in no time. 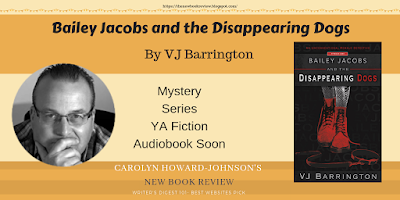 Bailey Jacobs and the Disappearing Dogs is VJ Barrington's first book in this series. Each novella in the series will be about 40 pages and will be self-contained, and 4 novellas together will create a novel that will also be available as an audiobook, narrated by VJ Barrington. He has plans for at least 3 or 4 full books (12-16 novellas), publishing at the rate of about one a month, so keep checking in for the newest adventure of Bailey Jacobs in her unconventional female detective role. VJ Barrington was born in Africa in 1966. Having lived and worked abroad most of his life, he has settled down with his wife and dogs in a quiet Victorian town on the Antrim Coast of Northern Ireland. He enjoys stories with plenty of twists and turns that keep you guessing until the end. This can be seen in his writing and his preferred authors who include Jeffrey Deaver and Agatha Christie. If you’d like to know more or would like to follow VJ Barrington, you can connect with him through his website, Facebook, and YouTube. Crystal is a Mom, wife, homeschooler, virtual assistant, ex-pat, and more. If you’re looking for fun activities, educational ideas, recipes, multiculturalism, reviews, freebies, and giveaways, you’ll find it all at Castle View Academy with a little dose of inspiration thrown in for good measure.